Nature to the power of 3! Use of recurring and costly chemical products to treat water or disinfect cooling towers often requires continuous monitoring by staff members as well as them having to manage/handle chemical products. More and more, operators are looking for a more sustainable approach to treat cooling water. A poignant example is ASHRAE’s 188 standard for Legionella bacteria control. EMO3, a company specialized in ozone technology for sustainable water treatment has answered this need by the industry with its Insitu-O3TM product line. Following a dangerous incident in chemical handling, a prestigious and publicly traded O&M corporation had approached EMO3 in order to assist with several things, including: (1) reducing the costly recurring need of biocides, (2) eliminate the dangerous handling of these biocides, (3) reduce water consumption in the cooling tower, and (4) improve thermal efficiency in the chiller. In addition, the customer wanted (5) a complete water management solution to automatically handle water treatment for the cooling tower. 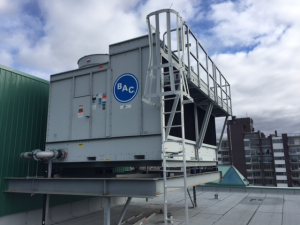 This client operated a total of eight cooling towers spread throughout the city ranging in cooling capacity from 600 tons to 2,400 tons. Wishing to validate the performance of the Insitu-O3 product as well as the responsiveness of the EMO3 team, the client decided to commit to a project-pilot test for its 1,000-ton cooling tower with 14,000 liters of water. This cooling tower represented certain challenges for the client, because it had a relatively high return water temperature (30° Celsius), as well as a high particle count. This is because no filtration ever had been installed on the tower. In addition, the client was complaining of a Legionella detection rate in excess of 10,000 CFU/L. Based on EMO3’s proprietary ozone cell design, the patent-pending Insitu-O3TM was deployed within two months of the client’s request. Focused on the solution, the EMO3 Team, moreover, integrated a dedicated PLC with EMO3’s water management software to handle the ozone disinfection, water conductivity, scale inhibitor injection, water blow-down as well as data-logging and BACnet capability. The Insitu-O3TM incorporates a closed loop, continuous cycle water treatment, thus avoiding sequential biocidal injection which is often insufficient. 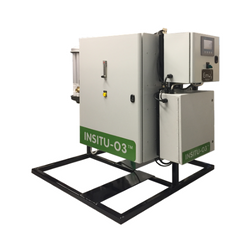 The Insitu-O3TM is independent of the thermal load for the chillers, thus providing continuous water treatment. In addition, several sensors provide optimal control and logging capability for the operators. Complete elimination of biocide injection, representing a savings of as much as $13,000 per year. Elimination of storing of and handling of dangerous products, resulting in an improvement in occupational safety. Reduction of 0.25 mm scale deposits in chiller tubes, resulting in an energy savings of $5,040 per year. Annual maintenance cost reduction of $800 per year. Improvement in water cycles of concentration, resulting in a reduction of water consumption by 54,000 liters per year. Bacteria counts below 1000 CFU/mL. Following the performance of the Insitu-O3TM solution, the client has installed several other Insitu-O3 units in order to benefit additionally from the above-mentioned advantages. Effects of three oxidizing biocides on Legionella pneumophila serogroup 1.